Edward John “Goat” Anderson played just one season in the major leagues, hitting .205 for the Pittsburgh Pirates in 1907. He also played 10 seasons in the Central, Eastern and Western Leagues. Despite the praise, Anderson was sold to the Rochester Bronchos of the Eastern League in January of 1908. While with Rochester, Anderson attempted to get a patent on a sliding pad he invented; there is no record of a patent being awarded. He also suggested a novel idea for improving his batting average. The small plate was the wish of a man who hit .222, .201 and .138 from 1908-1910 in Rochester. Goat Anderson saved his greatest moment for his final season in professional baseball. As the manager and leftfielder for the Terre Haute Terriers (or Terre-iers) in the Central League, he filed one of the most unusual game protests in history. 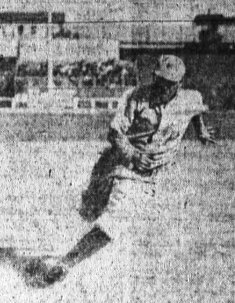 Goat Anderson (2), with the Terre Haute Terriers. “Don” was a Great Dane who belonged to a Fort Wayne man named Ed Longfield. Fort Wayne went on to score six runs in the inning to tie the game and scored a run in the 10th to win 7 to 6. Heilbroner ruled against Anderson’s protest saying the play did not have a sufficient impact on the outcome of the game, but he did order that Don would no longer be allowed on the field during games. Terre Haute finished fifth in the six-team league with 60-79 record. Anderson was rumored to be considering offers from Federal League teams for 1914, but never signed with a team and his career was over. He returned to his home in South Bend, Indiana. He died of stomach cancer 10-years later at age 43.